Previous report: There are severe delays on the M56 near Manchester Airport. Two lanes have been shut Eastbound near to junction five for the airport and there is around eight miles of queuing traffic back to the junction with the M6. 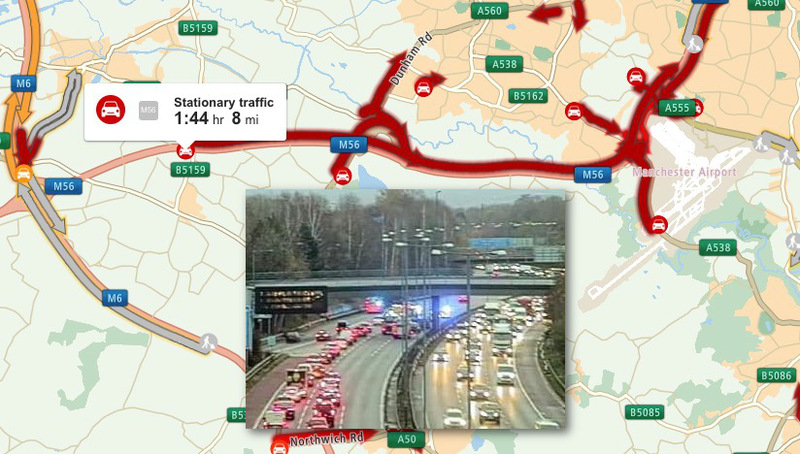 Two lanes closed, severe delays and queueing traffic for eight miles due to accident, three vehicles involved on M56 Eastbound at J5 (Manchester Airport). Congestion to J9 (M6 Lymm interchange). Traffic is also slowing on the opposite side. Lanes two and three (of three) are closed. Three fire engines are also working at the scene.